Our Lady of the Candles also formally known as Nuestra Señora de la Purificacion y Candelaria, also known as Nuestra Señora de la Candelaria is a Marian title depicted by a 16th-century Roman Catholic wooden image of the Blessed Virgin Mary venerated by Filipino Roman Catholics in the Western Visayas region. 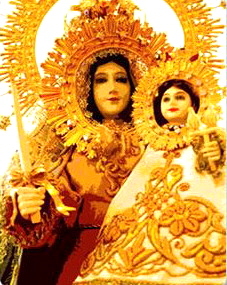 The statue is prominently known for carrying a candle and is locally known as the patroness of Jaro, Iloilo. It is enshrined in the Jaro Cathedral, recently named the National Shrine of Our Lady of the Candles, atop the balcony-facade of the church which is accessible by balcony stairs outside the church. Mary under this title is commemorated in the Presentation of Jesus at the Temple. In this regard, Mary is claimed to have participated in a rite of purification in according to the ancient Candlemas festival rooted in Halakha (Jewish law). The statue has merited Papal sanction from Pope John Paul II, who imposed a canonical crown to the statue during his Apostolic visit in February 21, 1981. The National Shrine of Our Lady of Candles celebrates its Marian feast every February 2 with a grand procession, Latin Tridentine Masses, and numerous parades. The historic stone image of Our Lady of the Candles is enshrined in St. Elizabeth's Cathedral, Jaro, Iloilo City, Philippines. The image shows Our Lady carrying a candle in her right hand. her left hand carries the child holding a globe. Traditional story tells that fishermen found a foot image in Iloilo River in 1587. Despite in size, the image was so heavy that 10 men could not lift it. When the people decided to notify the priest and take the image to the church in Jaro, one man succeeded in carrying the stone image. In 1874, Jaro became a diocese and a cathedral was built. At the time, the image was to be transferred inside the cathedral, it rained with thunderstorm and lighting for a whole week. 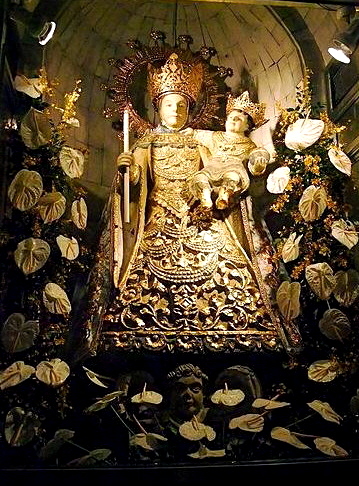 It was therefore decided to place the image in the the uppermost niche atop the facade of the cathedral overlooking the plaza so that "Our Lady might reign over the town as Protectress". In the beginning the people kept a vigil to light Our Lady's image but later this practice was forgotten. According to the Vicar General and former parish priest of Jaro, Iloilo City, Msgr. Jose M. Gamboa, Our Lady herself reminded the people about the neglect through the story. A Chinaman ran a sari-sari store across the church plaza. One night, a beautiful lady with long hair came to him and said "I want to buy oil because my son has no light". The Chinaman became curious and decided to follow the beautiful lady. He saw the lady bathing her child in the artesian well across the church plaza. He decided to go home. When he was about to retrace his step, the lady disappeared. He turned his back and looked at the top of the church which started to blaze with light. The beautiful lady was there at the Virgin's niche. The Chinaman was converted and up to this day, descendants still maintain a sari-sari store across the plaza. Between 1921-1939, the time of Msgr Luis Capalla, the Lady would disappear from her niche. She would be seen bathing her child in the artesian well. People who washed themselves in the water of the well were healed from aches and pains. In 1981, Pope John Paul II crowned the image of Our Lady of the Candles and the Divine Infant. The coronation ceremony was the greatest religious event in the history of Panay. Declared as the Patroness of Western Visayas, her feast is celebrated on February 2 whuch is Our Lady's Day of Purification. Salog (later hispanized to Xaro and finally Jaro), an encomienda of Francisco Duran. Jaro, originally located in Alanga (now part of La Paz), a visita or pastoral charge of Ogtong(Oton). Jaro was established as a parish. The change of patroness took place: from Our Lady of the Nativity to Nuestra Señora de la Candelaria. Fr. Bernardo Alisen began the transfer of the parish from Alanga to its present site because the settlement was unsafe from Moro raids. The transfer was completed by Fr. Juan Aguado who also drafted the basic town plan and constructed a convent and church a hundred meters from its present site (Salud Montinola Residence). The Jaro belfry was constructed. A strong earthquake damaged the church and the bell tower. Pope Pius IX decreed the creation of the Diocese of Jaro through the Papal Bull “Qui ab Initio”. The Augustinians ceded the church to the diocese in exchange for the parishes of La Paz and San Jose Placer. Mariano Cuartero, D.D. was appointed first bishop of Jaro. Mariano Cuartero, D.D. took possession of the diocese. He immediately began the work of enlarging the parish church of “La Candelaria” using the plans of Fr. Agueria. Construction of the present cathedral, supervised by Manuel Arguelles. The Cathedral, the Bishop’s Residence and the Seminary were inaugurated. Solemn transfer of the image of La Candelaria from the old church to its niche in the new cathedral. Restoration of the Jaro Belfry by Mariano Cuartero, D.D. Dennis Dougherty, D.D. (1908-1916) convoked the first ever Diocesan Synod of Jaro. James P. McCloskey, D.D. (1920-1945) convoked the 2nd diocesan synod of Jaro. Lady Caycay (earthquake) damaged the cathedral of Jaro and its belfry as well as many other churches in Panay. With the Papal Bull “Quo in Philippina Republica,” Pope Pius XII elevated Jaro as a Metropolitan Archdiocesan Church. Jose Ma. Cuenco, D.D. installed as the First Archbishop of Jaro. The Cathedral was reinforced and the twin bell towers were constructed by Juan Nilmar, D.D. Zaldivar painted the 4 evangelists at the pendentives of the dome. The Cathedral and its new altar were dedicated, “A Deo in Honorem Sancta Elizabeth”. The image was brought down from its niche supervised by Alberto Piamonte D.D. in full regalia. 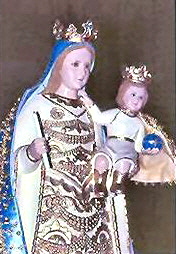 The image of Our Lady of Candles was canonically crowned by the Servant of God Pope John Paul II, the only image of the Virgin in the Philippines crowned by the Pope himself. Pope John Paul II proclaimed Our Lady of Candles patroness of Western Visayas. Parish Congress of the Parish of Our Lady of Candles. Angel Lagdameo, D.D. convoked the 3rd diocesan synod of Jaro. Start of the present General Repair of the Cathedral. Rededication of the Cathedral. Formally established as an Archdiocesan Shrine. Our Lady of Candelaria Church, Centro, Rio de Janeiro, Brazil, South America Photographic Print by Ian Trower. Product size approximately 16 x 24 inches. Available at Art.com. Embrace your Space - your source for high quality fine art posters and prints. Church of Nuestra Senora De La Candelaria, La Oliva, Fuerteventura, Canary Islands, Spain, Europe Photographic Print by Stuart Black. Product size approximately 18 x 24 inches. Available at Art.com. Embrace your Space - your source for high quality fine art posters and prints. Colombia, Bogota, La Candelaria, Gates of Iglesia De Nuestra Senora Del Carmen Wall Mural by Jane Sweeney. Product size approximately 48 x 72 inches. Available at Art.com. Embrace your Space - your source for high quality fine art posters and prints.